Thanksgiving is around the corner, and that means the kids will be counting down to Christmas very soon! Kids adore the anticipation of the advent season, and helping them count down can be a family affair. A handmade advent calendar can be a great family keepsake. Today I’m listing over 40 DIY Advent Calendars! There is a large variety of advent calendar ideas listed below. The first few are marked as Cricut projects and can be made with a Cricut machine. The remaining ideas vary from free printables to sewing projects. 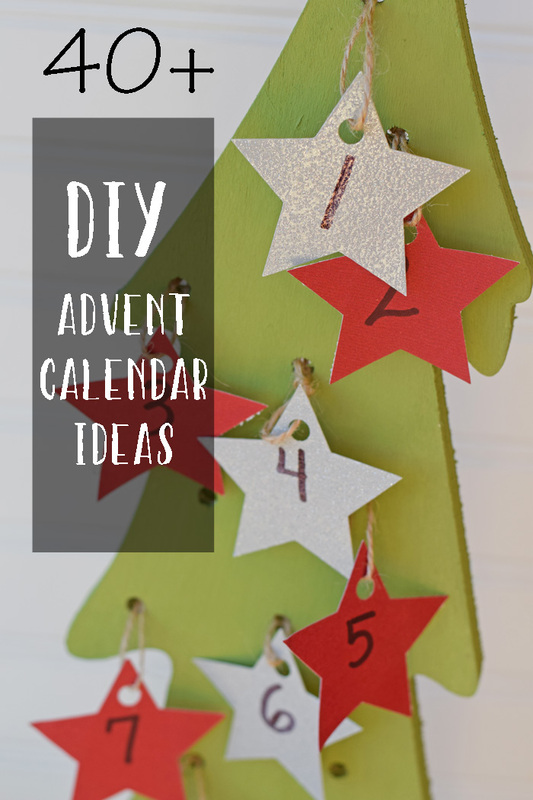 There is a DIY advent calendar project for anyone! I’m including a brief description of each project. Click the links within the descriptions to view the full tutorial for each. (Cricut project) Christmas Tree Advent Calendar – This one uses a Cricut machine to cut out stars and “thankfulness” prompts for each day leading up to the holiday season. (Cricut project) This sweet Christmas Advent Calendar from Sweet Red Poppy is a great way to break in your Cricut Maker machine with cutting fabric. (Cricut project) These no-sew stockings combine classic colors for a cute advent calendar idea from Fleece Fun. (Cricut project) Use iron-on vinyl on wood to make this Wooden Tag Advent Calendar from Practical and Pretty. (Cricut project) Try chipboard with the Cricut Maker to create the cute wood tags for this DIY Wooden Advent Calendar from Sweet Red Poppy. (Cricut project) Adhesive foil has always been a favorite of mine for holiday crafting. Combine it with a neutral backdrop for this lovely Modern Traditional Christmas Advent Calendar from Rambling Renovators. (Cricut project) Assemble a chipboard box with this 12 Days of Christmas Advent Calendar from 30 Minute Crafts. This DIY Advent Calendar from Everyday Party Magazine is a giving advent calendar idea, perfect for giving back. I recently saw some of the little present boxes at the Dollar Store! Life Sew Savory never disappoints with her sewing patterns. This Christmas Tree Countdown sewing project is no exception! For an unconventional advent calendar, try this Easy Christmas Advent Calendar from Country Chic Cottage. Save up those fabric scraps for this cute Fabric Advent Calendar from Laura’s Crafty Life. If you like the look of the Pottery Barn Advent Calendars, then you will want to check out this Pottery Barn Inspired Advent Calendar from New House New Home. This mini muffin tin places small toys in each section in this cute advent calendar from Hello Creative Family. This super simple Printable Advent Calendar from Country Chic Cottage makes counting down to Christmas easy. Grab mini envelopes for a cute framed Advent Calendar. Recycle a frame and use tags to make a lovely advent calendar like Legally Crafty Blog. A favor kit makes this DIY Advent Calendar from View from the Fridge a fun DIY. Inexpensive stockings make an easy advent calendar and decoration in this idea from She’s Crafty. If you like to sew, this lovely Advent Calendar from A Bright Corner will be a must-make! This Vintage Ladder Advent Calendar from Desire Empire would make a great conversation piece + Christmas decor! This Modern Advent Calendar from A Crafted Passion is another piece that doubles as a large piece of Christmas decor. Recycle those TP rolls in this advent calendar idea from Doodlecraft. My kids would love this cute boxes Advent Calendar from Powerful Mothering. Small tins can be repurposed in this Advent Calendar from Handkrafted by Stephanie. These stockings look cute as a garland and an advent calendar in one! Kids can color a advent themed picture to countdown each day with this idea from Bloom Designs Online. Countdown the Christmas story with this Christ is Born Advent Calendar from Sunlit Pages. Use scrap fabric for this adorable Advent Calendar from Design Mom. Get ideas for 25 days of service project ideas with this Advent Calendar idea from I Heart Naptime. This Christmas Advent Chart from The Painted Hive has classic styling for any Christmas theme. It also includes free printables! Add small treats with this Treat Bag Advent Calendar from Yellow Bliss Road. This Advent Calendar in a Jar idea from Just a Girl is a cute idea! The DIY Dreamer gives a great tutorial for an Advent Calendar that looks like a Christmas tree. This Advent Calendar by Simply Kierste also doubles as a garland. This Advent Calendar from A Bubbly Life pairs plastic animals with classic holiday colors for a whimsical and unique idea. My rough and tumble boys would love this Punch Box Advent Calendar from Studio DIY. You’d never guess the secret supply behind this cute Acorn Advent Calendar from Home Made Interest! Muffin tins make cute craft ideas, including this Muffin Tin Advent Calendar from Domestic Imperfection. This cute Big Box Advent Calendar from Mod Podge Rocks is a great holiday DIY. For a farmhouse look, DIY this Rustic Advent Calendar from Yesterday on Tuesday. Handmade in the Heartland features another adorable framed advent calendar! For a modern look, DIY this Geometric Advent Calendar from All for the Boys. This little felt pouch advent calendar at Skip to My Lou is so cute!